For reliable service and professional quality workmanship from a commercial roofing company you can trust, call New Roof Nassau County at: 516-400-6356. Our Licensed and Insured roof contractors have the solution to all your commercial roofing needs and are dedicated to providing our customers with premium quality service for every roofing project. We provide our customers full service roof construction by starting with an assessment of your roofing needs to determine the best fit and value for your situation. We can also help you with budgeting and planning for future roof construction projects. New Roof Nassau services all types of buildings and market segments including commercial offices, government buildings, healthcare offices, hospitals, schools, banks, industrial buildings, residential homes, commercial buildings, condos, Co-op buildings, and apartment buildings. Call 516-400-6356 now to schedule an appointment or to learn more about our Commercial Roofing services for your building. We service and install all types of commercial roofing systems and roofing materials on the market: flat roofs (low slope roofs) or steep slope roofs. Flat roof systems include single-ply, multiple-ply, Modified Bitumen, flat-seamed metal, and roll asphalt. 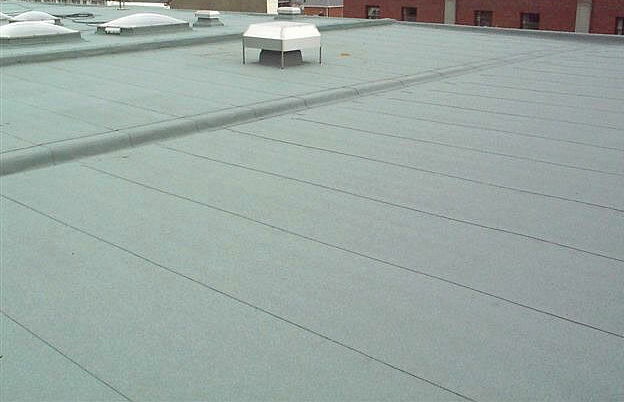 Single-ply flat roof systems also known as membrane roof systems include TPO, PVC, EPDM, and CSPE and are categorized as Thermosets or Thermoplastics. Call 516-400-6356 to speak to our knowledgeable roof professionals for assistance with membrane roof systems or commercial roofing. Multiple-ply roof systems also called Built-Up Roofs (BUR) include Traditional and Modified Bitumen. Steep pitch roofs types are metal roofing, asphalt shingles, 3-tab shingles, tile roofing, slate shingle, cedar shingles, and wood shakes. Request a Free Commercial Roofing Quote for more information. Our skilled roofing contractors have years of commercial roof construction experience working with all major roofing manufacturers including Carlisle SynTec, CertainTeed, GAF-Elk, Tamko, Firestone, IKO, Owens Corning, Johns Manville, Sika Sarnafil, Fabral, Soprema, Malarkey, Pabco, Decra, Polyglass, Met-Tile, Monier Lifetile, EcoStar, Tremco, Durolast, Classic Metal Roofing, and more. We provide Emergency Roofing Services and our roof specialists can help with planning and budgeting your roof construction projects.